An unidentified device went off at about 14:40 Moscow time on Monday in a subway train car when it was moving from Tekhnologichesky Institut Station to Sennaya Ploshchad Station. The Russian Investigative Committee has qualified the blast as a terrorist attack, but other versions are being looked into as well. Russia’s Investigative Committee has named the man who detonated the bomb on a St. Petersburg metro train on Monday afternoon. The man's name is Akbardjon Djalilov, he was born in 1995, IC spokesman Svetlana Petrenko said. A person who carried out an explosion in the St. Petersburg subway left a bomb at the Ploshchad Vosstaniya metro station, Petrenko has confirmed. "Preliminary analysis has shown that the explosive was placed in a fire extinguisher and was filled with striking elements in the form of small metal balls and nuts like the exploded bomb. It was expected to be triggered by a mobile phone rather than by a timing mechanism," a source told TASS earlier. "This is why mobile phone communication was switched off. Soon after that, the explosive with a blast equivalent to 1 kg of TNT was defused", the source added. Specialists continue to study the exploded bomb and the remains of a suspected suicide bomber, the source said. The detonated bomb was similar by its filling to the explosive device defused at the Ploshchad Vosstaniya subway station and had the same striking elements. It has been reported earlier that the suspect was a Central Asian who had ties with Syrian militants. "He was in the train’s third carriage near the doors, judging by the damage to the wagon. When the train started moving, an explosive device with a power equivalent to 200-300g of TNT was detonated. The blast wave actually smashed the wagon’s door but the train driver who was acting strictly under operational instructions did not stop the movement and drove to the next station. Several bodies were found in the tunnel as they were blown out of the train," a source told TASS. DNA testing will be required to identify four of the victims of the terrorist attack, Russia's Investigative Committee said on Tuesday. The Committee published a list of the victims at its website. Identities of ten people have been established to date. Kyrgyzstan is offering all-round assistance to Russia in probing into the terror attack on St. Petersburg’s metro, Kyrgyzstan’s Foreign Ministry said in a statement on Tuesday. The ministry also said that Akabrzhon Dzhalilov, who is suspected of committing this terror attack, is not a Kyrgyz national. Dzhalilov "has never received a Kyrgyz passport," according to the ministry. "In 2011, when he turned 16, he received a Russian passport and has been living in Russia ever since," the ministry said. Security checks at the St. Petersburg metro are conducted on a regular basis, city governor Georgy Poltavchenko told reporters on Tuesday. "Security checks are conducted on a regular basis. The investigation will show whether the security systems were efficient or not," he said. The death toll in the blast that rocked the St. Petersburg subway has reached 14, according to Russian Health Minister Veronika Skvortsova. "Today, we can verify the death of 14 people: eleven at the scene and three others died in an agonizing condition, one of them at the stage of transportation in the ambulance and two others - at a reception area of Mariinsky Hospital of injuries incompatible with life," she told reporters. According to the minister, 49 people remain in hospitals now. "Thirteen have been released [from hospitals]. All patients are examined by the best specialists every day and are provided with medicine and blood," Skvortsova added. All those affected by the Monday blast have been identified by now, the director of the I.I. 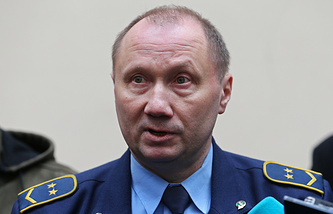 Dzhanelidze Ambulance Research Institute Valery Parfyonov has noted. Health Minister Veronika Skvortsova said that a number of patients had remained in a state of coma since Monday. "On Tuesday morning the comatose patients have come to their senses and named themselves. One woman patient is in a medically induced coma, which makes it easier for her brain to cope with pain," Skvortsova said. Monday afternoon’s blast hit three foreigners and guests from 17 Russia's regions, according to the city's Governor Georgy Poltavchenko.